With three kids and a busy work schedule, it has been REALLY hard to get healthy meals on the table EVERY night. We have had our fair share of cold cereal for dinner, mystery leftovers from the freezer, and fast food take out. That doesn’t make me a bad mom, but I know I can do better. So, I went looking for an organic meal delivery service that offered variety, value, and meals my kids actually wanted to eat. What I found was Sun Basket. Sun Basket recently sent me three of their meals to try out with the kids. Since I was in the beginning of my 21 day Once a Day 4 The Planet Challenge where I would eat plant based foods one meal a day, I was excited to try two of the vegan Sun Basket meals. I also ordered one more tradition meal featuring steak. I received these meals in exchange for this review. So I wanted to tell you about each meal and overall thoughts about this organic meal delivery service. This article does contain affiliate links. I get commissions for purchases made through those links in this post. You get this recipe book with each order that gives you the recipes for all weekly recipes. Buying organic produce and sustainably sourced proteins is important to me. I try to buy organic and/or non-GMO verified as much as possible (depending on cost and my budget). So, I really like that Sun Basket provides customers with both. They use seasonal organic produce, antibiotic-free and hormone-free meats, and wild-caught, sustainably sourced seafood. Note: the Sun Basket website says they are “99% organic”. All of the produce I received was 100% certified organic . I’m not entirely sure what that 1% is. The company has relationships with their partner farms and vendors. It’s a relationship they are proud to display on their website and you can read more about each one. Placing an order is really simple! Sun Basket makes it easy to order what you want, when you want. 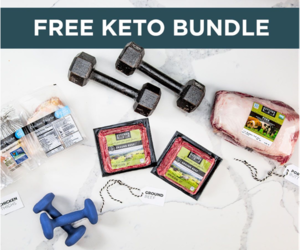 Once you sign up for service, you select your meals each week, indicate if you want 2 or 4 servings on the Classic Plan or 4 servings on the Family Plan, and request your delivery date. The hardest part is deciding which meals to select. If you need to skip a week, you can easily do that too. 50% off Family Meals! Each of their meals features fresh organic and sustainable ingredients with many kid-friendly recipes. I mentioned earlier that I choice two vegan meals and one Chef’s Choice meal. I really like that I can choose meals that are perfect for me and my family. I like the ability to mix and match between meal plans is really nice. That’s why I was able to try those new-to-me vegan recipes and a classic steak dinner all in the same week. This is how each meal is packaged. Each ingredient is label and packaged by meal in a bag. 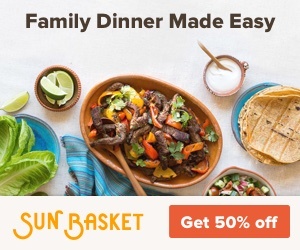 Sun Basket currently has a special where you can get $35 off Sun Basket meals or 50% off Family Meals! Each of their meals features fresh organic and sustainable ingredients with many kid-friendly recipes. My kids really liked the three meals we received. Out of the two vegan recipes, the kofta curry is the clear favorite and is something I am looking forward to making again and again, especially as part of a new camping meal plan. I liked that all the Sun Basket meals are designed to be cooked in 30 minutes or less. Recipes are easy to follow and in most cases recreate. The only exception to this is on the spice blends. Sauces like the lemongrass paste can’t be recreated exactly, but you can wing it and come pretty close. Average cost per serving is between $10-$12. Overall Sun Basket offers a great organic meal delivery service. One of the advantages to their service over others is that their delivery materials (box and packing material) are recyclable. Ingredients are stored/delivered in reusable or recyclable containers. Less waste makes me happy. The easy to create recipes make my family happy. But don’t take my word on it. Try them for yourself.